Since the launch of American Affairs three months ago, a favorite topic of commentators has been the inversion of the usual order of policy journals and political movements: this time, a “populist” political movement achieved power before its theoretical contours or specific agenda had been thoroughly defined. Moreover, this journal, although in many ways provoked by the 2016 campaign, arose independently of the new administration. The extent of any affinity between the two remains to be seen. We are as cognizant of these challenges as even our most impatient critics, and we are in fact grateful that there are so many of the latter. It is rather flattering to have such a surprisingly large number of people demanding to know our positions on everything from health care to foreign policy. And however much we would like to have comprehensive essays on every conceivable policy topic, several years of publishing simply cannot be completed in a few months. We, therefore, thought it might be helpful to offer a summary of our personal views here (though the journal as an institution does not take policy positions), which might also serve as a preview of future articles. Trade: Trade policy is a key area of focus for us and a broad topic that includes everything from tariffs to monetary policy and more. In our first issue, Clyde Prestowitz’s article “The New Face of Globalization” offered a number of policy proposals, and Reuven Brenner’s article in this issue includes a proposal for exchange-rate stabilization, an essential prerequisite of any improved trade policy. We will continue to offer ideas on trade agreements and other specific measures. At bottom, however, rethinking trade means rethinking the theoretical foundations of economics and moving beyond the textbook abstractions that have justified decades of failed policy. We support recent administration efforts to impose countervailing duties on various products. We are hopeful for additional measures that address the broader problems of recent trade policy rather than simply offering corrections to specific abuses. In our view, the refusal to label China a currency manipulator is not a betrayal of any campaign principles. Although such a step should probably have been taken several years ago, it is no longer appropriate today and would not represent a serious solution to the real problems of the present. Health care: In general, we support universal health care administered by the government. This could involve an outright “single-payer” system—which we have no ideological objection to—or something like a “Swiss system,” which continues to involve private parties but under which premiums exceeding a certain percentage of income are straightforwardly subsidized by the government. The government should also take a much clearer role in controlling costs and setting prices for procedures and prescription drugs. The failure of Obamacare stems from the fact that it was an attempted compromise between public and private health care, but it merely combined the worst of both worlds. Rank-and-file Republicans certainly want the law changed, but we doubt that they are especially interested in conservatives’ empty sloganeering about the “free market.” Any solution will have to involve more comprehensive and straightforward government involvement. Conservatives’ insistence on “private” health care is at this point purely ideological and counterproductive. We have not had a “free market” health care system in this country for decades, and obscuring that fact only makes it more difficult to improve the system. Today’s small cartel of health insurers no longer offers any meaningful market in the choice of health insurance, which for most people is chosen by their employer anyway. In most circumstances, the choice of actual medical care is hardly governed by market principles. The U.S. system, whatever “market” aspects it retains, has failed completely at containing costs compared to the rest of the world. There is, furthermore, no basis on which to believe that corporate health insurance bureaucracies ration care in a manner any more just or efficient than a government bureaucracy would. Under the latter system, at least, people will know whom to lobby for changes. Finally, in any system that does not refuse care to those unable to pay for it, it is simply prudent to insure all citizens. For the reasons above, we were naturally disappointed by Republicans’ recent efforts to repeal and replace Obamacare. Even after eight years, Paul Ryan and his oft-celebrated policy wonks could offer little more than a new tax credit scheme. We hope that the administration will ignore partisan orthodoxy when the issue comes up again. Corporate taxes: Because corporate tax policy is connected to trade policy, we support a broad reduction in corporate tax rates in order to bring the United States into closer alignment with the rest of the developed world. Because such a reduction in corporate rates should minimize the incentive for “tax inversions” and other such maneuvers, the administration should maintain and strengthen measures designed to limit these strategies in the future. In other words, the administration should encourage, with both the carrot and the stick, the “re-onshoring” of capital held overseas by American corporations. We are skeptical of the House Republican plan for a “destination-based cash flow tax.” In addition to creating complexity, its effects on trade and consumption are highly questionable as long as it is implemented under the current floating currency regime. We would, however, be quite open to the imposition of a more conventional value-added tax (VAT) in conjunction with a reduction in corporate income taxes. This combination, quite common in the rest of the world, would allow for offsetting revenue losses while also minimizing taxation disparities that adversely affect American trade balances. Personal taxes: The importance of personal tax rates has been grossly exaggerated since the 1990s. Although we generally favor tax code simplification—since complexity effectively functions as a subsidy for the very wealthy—we consider personal tax issues a lower priority. We are in fact quite skeptical of the conservative orthodoxy that reflexively prescribes tax cuts as the cure-all for every ill. In today’s circumstances, reducing upper-income tax rates is unlikely to address core economic challenges in any significant way. We are equally skeptical that tinkering with line-item tax incentives will achieve meaningful results. The child tax credit, for example, strikes us as unobjectionable, but its likely impact would be insignificant. -net-worth individuals, a fact which the endless debate about tax rates largely ignores. Financial regulation: Financial regulation is by nature complex and difficult to summarize, though we support measures such as the elusive “Glass-Steagall for the 21st Century” and the closing of the “carried-interest loophole.” The deregulation that occurred during the Clinton and Bush administrations has rightly been blamed for contributing to the financial crisis, but trade and other imbalances contributed to the expansion of the financial industry and its bubbles as well. Separately, we oppose efforts to “reprivatize” government-sponsored enterprises (GSEs) such as Fannie Mae. The GSEs cannot serve two masters. As long as their business model depends upon a government guarantee, they should remain wholly owned by the government. They can be permitted to accumulate capital on their own balance sheets (any private market equity contributions will be trivial relative to the size of the GSEs anyway) without subjecting them to the short-term motivations of financial investors that could create the conditions for another housing bubble. Infrastructure: American infrastructure has suffered from a misguided reluctance to commit to necessary spending on one side, and a misplaced enthusiasm for boondoggle projects and clientelism on the other. As outlined in Aaron Renn’s article in this issue, we support spending primarily targeted toward rebuilding existing infrastructure and are skeptical of relying too heavily on the private sector. Immigration: Although it has become something of a cliché, we favor a “Canadian” approach to immigration. Streamlining high-skill immigration while limiting low-skill—and eliminating illegal—immigration offers one means to support wage growth. At this point, the United States does not even have a loose immigration policy; we basically have no policy at all. In addition, we oppose programs such as H-1B, which tie temporary foreign workers to employers, create further downward pressure on wages, and have questionable benefits for American productivity. Technology and innovation: David P. Goldman’s essay in our first issue addressed the importance of defense spending as a driver of technological innovation and economic growth. Although the issue of “technology” extends beyond any specific government policies, we will continue to explore both the economic and cultural aspects of this topic. Foreign policy: Our overall approach to foreign policy was perhaps best summarized by Michael Anton in issue 1: “correcting the errors of the neo-interventionists does not require adopting those of the paleo-isolationists.” So far, the actions of the Trump administration, in which Mr. Anton is a member of the National Security Council, seem to be consistent with that broad principle. Yet we are less interested in classifying foreign policy actions into theoretical doctrines than we are in better understanding the critical areas of the world. To that end, this issue includes two pieces on Russia. The goal of foreign policy writing should be to supply the information needed to frame prudent policy responses to a given situation, and not merely to dilate on what is consistent with some contrived ideology. 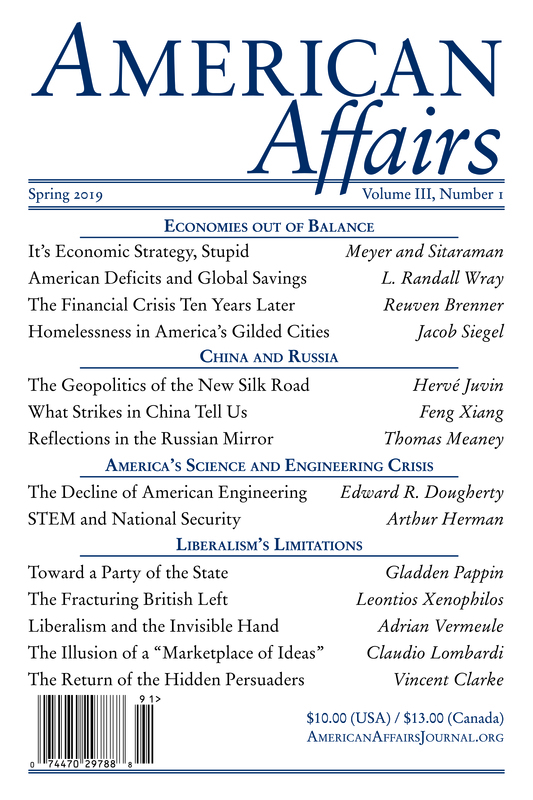 Forthcoming issues of American Affairs will explore many other topics as well, including education, environmental and other regulation, crime and incarceration, foreign aid, universal basic income, and more. To date, the principal criticisms we have received fall into two categories: our articles are either insufficiently wonkish or insufficiently outlandish. We reject both. The Clinton-era cult of the policy wonk, which only continues to grow, is based on the pretense that all serious political questions have been resolved, and that whatever problems remain are technical rather than political. The wonk’s conceit is that “politics” is simply a matter of tinkering with administrative arcana, a pastime best reserved for former or aspiring bureaucrats and lobbyists. The “policy innovation” preferred by the wonk mistakes complexity for seriousness and masks a fundamental affirmation of the status quo. Proposals for tweaking interstate barber licensing requirements or altering the opt-in clauses of health savings accounts, for instance, are ultimately as inconsequential as they are soporific. They are excuses to justify think-tank donations more than anything else. There are many problems confronting the United States, but a shortage of policy wonks is not one of them. And most of the solutions to present challenges are neither new nor especially exotic, though many remain far from official policy and constitute long-term, not short-term, goals. This leads to the second complaint of certain know-it-all critics, namely that the aims of our first issue were not eccentric enough. Throughout 2016, the media presented both Trump and Sanders as essentially lunatics. The former was supposed to be seen as evil and the latter adorable, but neither was supposed to be taken seriously. Yet it was they who addressed the serious concerns of the electorate. Meanwhile, their opponents repeated scripted talking points from two decades ago that had become altogether meaningless. Moreover, since Trump’s election, how many times have we heard that his administration would end NATO, destroy the economy, and even threaten democracy? Yet it was the ill-conceived foreign policies of the last three presidents that are responsible for the weakening of our alliances. It was not “populists” who presided over catastrophic boom-bust cycles or the combination of rising inequality with slowing growth and productivity. And it was not Trump but the media, the political establishment, and their donors who have progressively excluded the Constitution, the Congress, and increasingly the American people from American politics. Today’s “populism” in fact offers the best hope for correcting the errors of its predecessors. The new “populism” has identifiable legislative commitments, yet its radicalism resides not in implausible policy demands but in a new intellectual outlook. It is about recognizing that the ideological categories of Right and Left are no longer relevant to the essential questions of the present. It is about recognizing that today’s economy has little in common with Adam Smith’s capitalism and that there is no longer a straightforward policy choice between the “free market” and “government intervention.” It is about recognizing that leaving the people out of decision making results in a more fragile and dangerous politics. The choice is not between the apolitical individualism of universal consumerism and the ever-shifting narratives of identity politics. These are merely different sides of the same globalist, neoliberal coin. The true alternative is the reconstitution of a common American citizenship that stands in contrast to both. 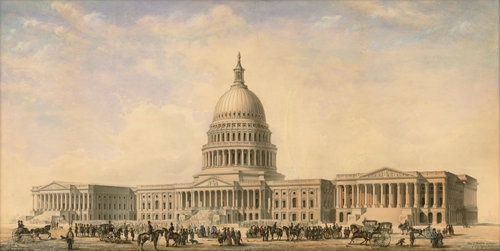 The essential task is the redefinition of the American people’s distinctive interests in the present, and their unique hopes for the future. This article originally appeared in American Affairs Volume I, Number 2 (Summer 2017): 3–8.